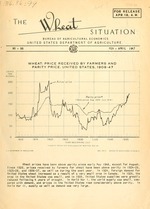 Wheat prices have been above parity since early May 1946, except for August. World War II, supply as well as demand was very large. pages 12 and 13; 1922-30, August 1945, pages 20-21. 3/ Beginning 1938 includes unredeemed loans at average loan value. for March 1947 = 88.4 x 2.29 = 2.02. dic:. : be a 1'7 'he.- cr' of a:.-nroxin-ely 1.2 0 million 1s3hels. forem .n and donest'ic der_'nc . exneni--Liti--s 3.o T'he c. ssen- il foo" ia-seir;' s, 7'a--irticu!larlyT blre:i grains. Cthoeir- eroorts s"in ro recover ,. to have any old-crop w,.heat or next July 1.
in these three years we-e responsible for the record crops. all wrhea-t in 1947 of approiimr. tely 1, 240 million n bushels. in -he carry-over on July 1, 19iQ also is likely. cen' larger than in 1-'!-6 and the large since 1938.
acreage of recent years are shown by areas in Table 1.
further reduction in stocks will be possible. in Soviet Russia are reported, to have wintered favorably. bushels. Production last year was 332 million bushels. considerably above the 1935-39 average of 13.1 million acres..
law provides for loans beyond 1948 of 52 to 75 percent of parity. following harvest, but advanced a'-:v.e iT later in the season. average loan rabe to growers for the 1947 crop at 90 percent would be $1.82. may attempt to adjust production to world demand within a flexible price range. tion and increase their exports so that -they can buy from the U. S..
gone to UNTJRA countries and to occupied areas. supplying minimum requirements to deficit nations still exists. interest, and t-xes (1910-14 = 100), which in Mardh 1947 was 229 percent. by UNRRA as well as occupied areas, our exports will, of course, remain quite hign.. Wheat imports by the paying countries will continue large f6r another year. culties, however, exports in 1947-48 are likely to be Iarge. difficult until their exports begin to recover. The outlook for exports to the Oriont is still somewhat con-fused by sov-. until production of rice in Burma recovers. agreement which may be reached at London will be subject to Congressional action. Turkey, United Kingdom, Uruguay, United States, and Yugoslavia. pluses; and (4) promotion of increased wheat consunption. 122, seed 81, and exports and shipments 43.
resulting from the war became the important price factor. area and from the Pacific Northwest. of wheat to maintain their wh-eat inventaries and assure-uninterrupted operation. higher prices on a strong market. ports relative to any unfavorable new crop developments. Corporation plans to export now crop wheat .-.. early harvests in the Southwest. but also to take care of backlogs for the domestic market. June 30 are expected to be about 360 million bushels. With imports negligible. exports since flour not sent to these countries will be shipped to other countries. 525 for food, 180 for feed, and 87 for seed. With wheat prices high relative to. ant from the report of April 1 stocks in all positions to be released April 25.
oration does not expect to have any old-crop wheat next July 1. 824 million bushels, and by July 1946, to about 373 million. 46, but considerably above the 650 million in 1938-39 and 625 million in 1939-40.
than the four principal ones. world trade in wheat. Prices to deficit countries usuallyr re :.c uch le-er. are unlikely to reduce protection aids to their domestic producers. included with "other spring" wheat. new wheat is 102.8 million bushels, which is used as year-end carry-over in the 1936-37 marketing year. dutiable flour in terms of wheat. Wheat imported for million, in bond is .excluded. Included food for both civilian population and the military forces . includes military exports for European relief and exports by the Department of Agriculture. 5/ Less than 50,000 bushels. : il. Mil. Mil. Mil. Mil. Mil. Mil. Mil. : ba. bui bu. bu. .bu. bu. 'bu. bu. / Includes Canadian wheat in U. S.
2/ Customs exports usel for entire period. 3/ Includes use of wheat as fuel and also loss due to grain going out of condition. fiscal yealr basis Commerce figures include Lend Lease. 2/ 'Net im6pts. durumi represent three Staies only -- Minnesota, North Dakota, and South Dakota. and other Ivail.ble check data. 4/ Prospective plantings.
. ....................... o.. ...... 0 0 .. .......... ..... ... ........ ..
7-Average of daily cash quotations.